Are you looking to buy an air fryer? 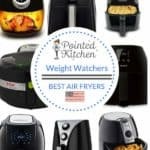 If so this concise round up of some of the best air fryers available will save you the time and effort of reading through mountains of online reviews. 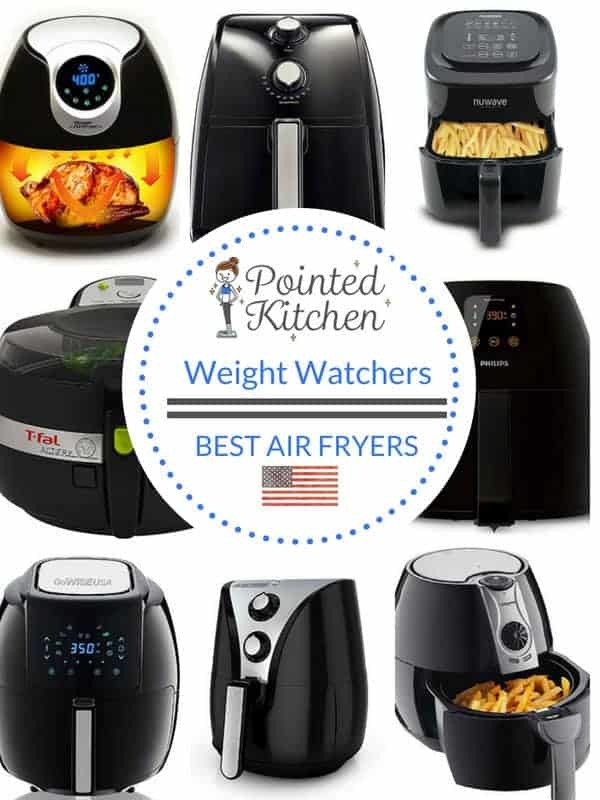 Air fryers are fast becoming known as a Weight Watchers best friend, once you purchase one you will see why! This Power AirFryer XL has 5 multi cooking modes, air fry, roast, grill, bake and saute. 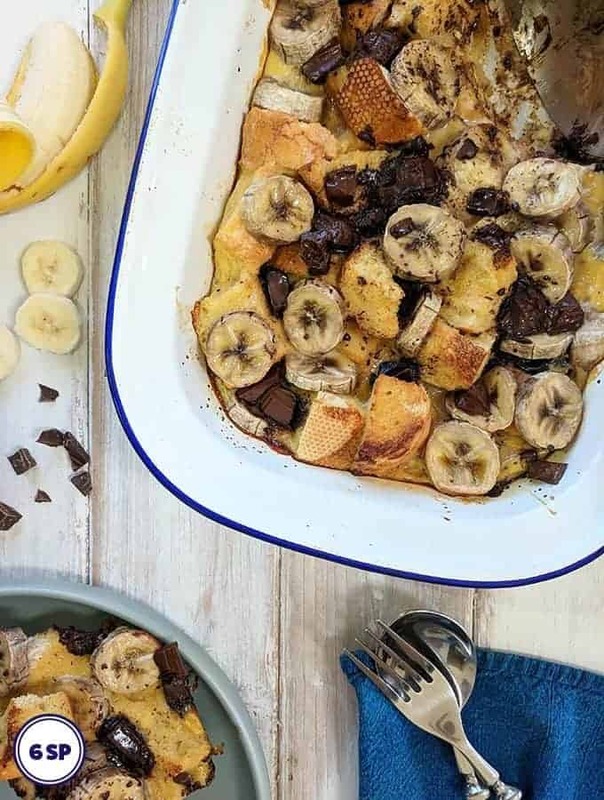 It comes in two sizes – 3.4QT and 5.3QT (the 3.4QT is big enough for 2 people whilst the 5.3QT is big enough for 4 people HOWEVER this is obviously dependant on your serving sizes and what you are cooking). The 3.4QT is 12.8″ Height x 11.4″ Width x 13.2″ Depth. The 5.3QT is 14.5″ Height x 12.5″ Width x 14.9″ Depth. The Deluxe version includes a basket with divider for when you want to cook more than one thing at once, a recipe book, a pizza pan, cooking tongs and a baking tray. The digital display is easy to use with 7 preset programs including ‘French Fries’, ‘Baked Goods’ and ‘Shrimp’. It is odour free and is very easy to clean. Fries come out crispy and fish and chicken come out tender. The ‘Easy Load Basket’ can be temperamental! The basket needs to make contact with the back of the unit for it to work and some users have found this to be a problem. Some users have found that the coating on the bottom of the basket has started to peel. Replacement baskets are expensive! The 3.4QT Power AirFryer XL is available here from Amazon & the 5.3QT Power AirFryer XL Deluxe is available here from Amazon. 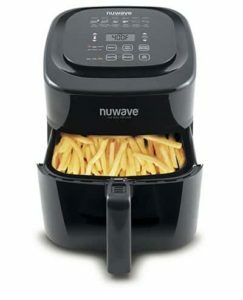 This is one of the cheapest air fryers that was reviewed. The 2.6QT model has a 2.2 pound food capacity whereas the 5.3 QT model has a 4.4 pound food capacity. The touchscreen models have pre-set cooking functions such as ‘Chips’ ‘Shrimp’ & ‘Cake’ whereas the dial model just has a temperature dial. The removable basket is easy to clean and is dishwasher safe. Thick frozen fries will cook in 17 – 21 minutes and chicken pieces take approximately 20 – 30 minutes to airfry. Users have complained about a plastic/ chemical smell when used although this is often rectified with use. The drawer can be difficult to engage and the basket button can be a little difficult to use. Some users have reported that the timer can be temperamental. The 2.6QT model (shown) can be purchased from Amazon here. Other models are available at BJ’s, Belk, Macys and JCPenney. The 3QT & 6QT models have 6 preset menu selections, have a temperature range from 100 to 400 degrees and have a removable divider. The 10QT model has a rotisserie function and the unit allows the programming of 100 recipes. Cooking is odour free, the unit is relatively quiet when frying and it is easyish to clean. A Gourmet Accessory Kit can be brought separately (or in bundle with fryer) which includes a baking pan, a reversible rack and recipe book. There have been complaints about the coating on the inside of the basket flaking. Problems have been reported with the tray removal and insertion. Food tends to take longer to cook than outlined in the manual book. The NuWave 3QT can be brought at Amazon here & the NuWave 6QT model with Accessory Kit can be brought from Amazon here. The 10QT model can be purchased either new or refurbished here on Amazon. 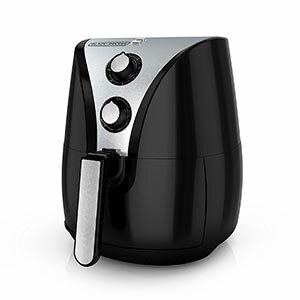 The Avance XXL Airfryer (4QT) has a 3lb food capacity & will fit a whole chicken or 2 bags of fries. Of all the air fryers reviewed the Philips seems like the most sturdily made but it is also the most expensive! 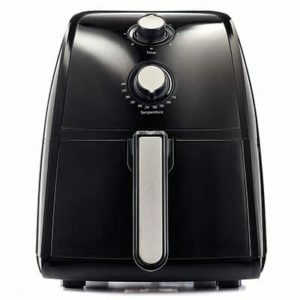 The food comes out of this air fryer crispy and golden brown and because of this it has had some excellent reviews. In my opinion the Philips air fryers cooks better then any of the other air fryers listed here. Accessories can be brought to fit different models, such as a baking pan, a variety basket and a layered rack. Many users have suggested that the compact model is too compact and that if cooking for two the XL model is needed. The dimensions of the Philips Airfryers are bigger than most other models. 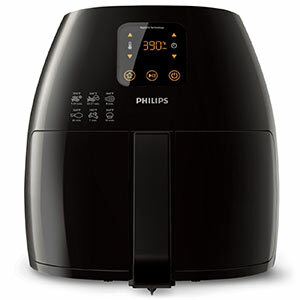 The Philips Avance XXL Airfryer can be brought from Amazon here. The Philips Avance XL Airfryer can be brought from Amazon here. The Philips Compact (digital) can be brought from Amazon here. It cooks frozen french fries in 15 – 18 minutes and chicken thighs in 17 – 20 mins & they come out crisp and golden. The Black & Decker Purifry is one of the cheapest models reviewed. As with a lot of the other air fryers, there has been a problem with the coating on the inside of the basket flaking. Some users have complained about a slight plastic / chemical smell from the unit when cooking. The writing on the temperature dial is so small that it is unreadable to a lot of people. The Black & Decker Purifry can be purchased here from Amazon. This T-fal model has a food capacity of 2.2lb (1 Kg). It measures 19.1 x 11.75 x 15.6 inches so is larger than many of the other air fryers reviewed. 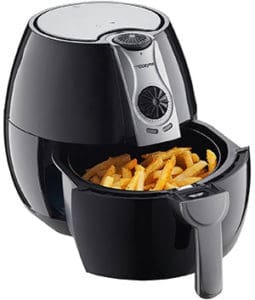 Unlike the other air fryers that have been reviewed so far, this ActiFry has a paddle which rotates to move the food around meaning you don’t have to remove the basket to shake it half way through cooking. As the paddle moves the food around, the oil is distributed over the food and things are cooked evenly. A ‘snacking grid’ can be brought for some models (but not all) at additional cost so that more delicate food can be cooked above the main basket. It is very easy to clean with a dishwasher safe lid, bowl and paddle. Without the additional ‘snacking grid’ you are limited with what you can cook as delicate food can be damaged by the moving paddle. I learnt this the hard way! This is a big unit for not a huge food capacity. You will need a lot of counter space for it. Food isn’t always crisp especially if the basket is filled to capacity. The timer can be temperamental – sometimes it will work, sometimes it won’t! 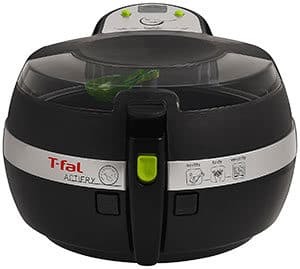 The T-Fal 2.2lb AirFryer can be brought from Amazon here. 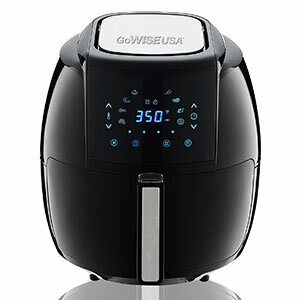 There are a number of GoWise air fryer models some with dial control and some with touch screens. The smaller 2.75QT models come in a variety of different colours including blush & mint & teal. This size is really only practical for cooking for 1 or 2. The 3.7QT programmable air fryer comes with 8 cooking presets including fries, chicken & cake. It comes in black, chili red, plum and white. It is big enough for 2 – 4, depending on what is being cooked. The 5.8QT XL 8 in 1 air fryer has preset cooking programs including fries, chicken and shrimp & comes in black, plum, chili red & white. It is big enough to cook for 4, depending on what is being cooked. The GoWise fryers cook the food well with fries being crispy and golden on the outside and fluffy inside. Like most of the other air fryers that have been reviewed here, some users complain of flaking inner basket coating. The basket and release button have been a problem for some customers. A chemical smell when cooking has been reported. 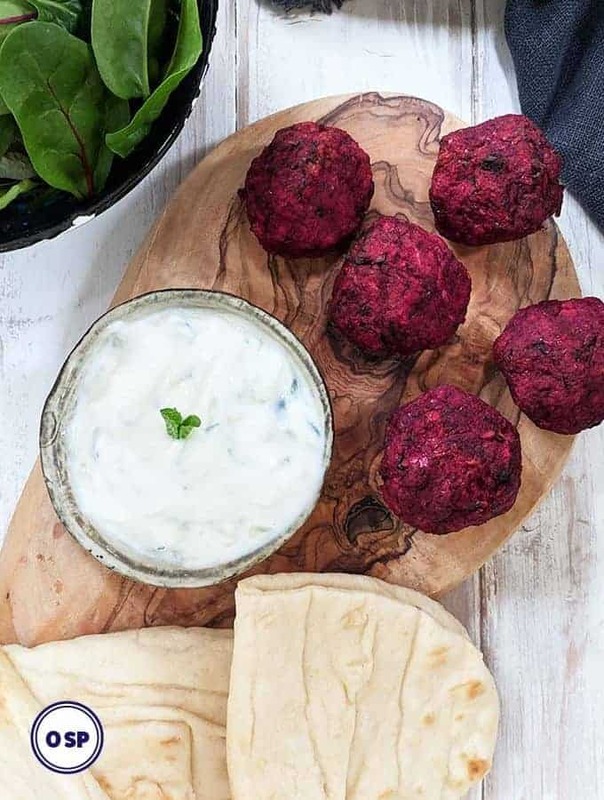 The 5.8QT air fryer XL can be purchased here from Amazon and the 5.8QT with a 6 piece accessory pack including a pizza pan, rack with skewers and a baking pan can be found here. The 3.7QT dial model is 13 x 11.5 x 12.2 inches and is big enough cooking capacity for 2 – 4 people. The 5.8QT model is 16.4 x 14.2 x 13.7 inches and is big enough for 4 people (dependant on what is being cooked & serving sizes). This brand is very reasonably priced. Yep, you guessed it! As with other air fryers there are reports of the the finish flaking away from the basket. There are reports of difficulties engaging the basket. Difficult to set an exact temperature with the analogue dial. Fries do not get crispy, at least not as crispy as the product photo suggests, without using a quite a bit of oil. The 3.7QT dial model can be brought here from Amazon and the 5.8QT can be found here on Amazon. 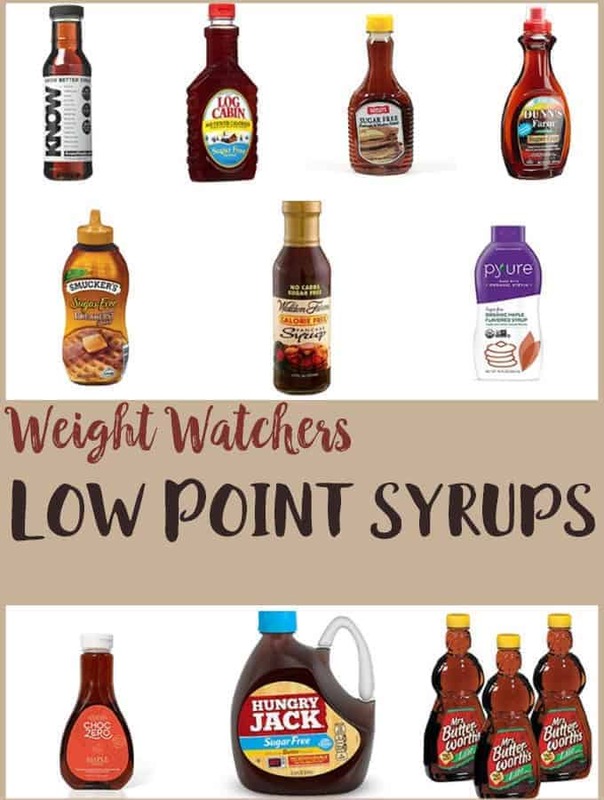 This Best Air Fryers post contains affiliate links. Visit this page to see what that means. 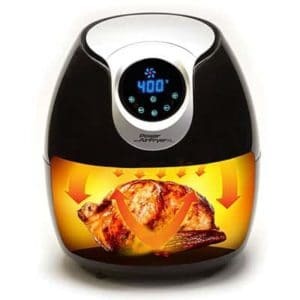 Are there any air fryers that you would 100% recommend as I’m currently on a weight loss journey however I still enjoy home made KFC style chicken, what air fryer if any would you recommend that won’t peel non stick coating on inside and my family and myself will continue to enjoy my coated chicken from.